To keep GRS Group employees connected, the commercial real estate company provided its employees with Apple iOS devices. When Marc Schnitman joined in 2013, Apple devices were deployed, but Apple device management was virtually non-existant. 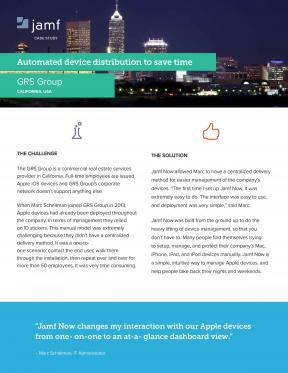 See how, with the help of Jamf Now, GRS went from relying on ID stickers and a time-consuming, manual model of device management, to a centralized delivery method for easier management of the company's devices.